I think one of the biggest problems for people with ADHD is that most of us are fast food eaters or we eat lots of snacks and not so many REAL meals. I am guilty. I admit it. Rest easy, I am NOT going to tell you to stop eating fast food or stop snacking. No. I won’t do that. I’m not that kind of guy and I really should not give advice I am not going to follow myself. Stop snacking? As if! Instead, I am going to tell you about a snack I love: POPCORN! A Recent study showed that it is actually a pretty healthy snack and that’s exactly what I needed. Scientists reported that popcorn may have more healthful antioxidants than fruits and vegetables. It’s also filling, which is important because IF I do not feel full I will continue to snack. I love snacking, so to do less of it fullness is very important. However, let’s be honest here, I use microwave popcorn and most of the available packages in grocery stores include ingredients that pretty much overtake any possible health benefits. Therefore, I eat an ALL NATURAL type with no sugar and no salt added, and with very little other ingredients. My advice, if you really like butter or salt, get a natural package, then add real butter and sprinkle a bit of salt or other toppings as YOU want it. It’s up to you. 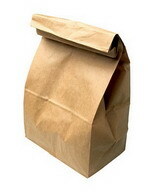 1) Need: Brown paper lunch bag & Bulk Popcorn Kernels. 2) Put single half Scoop of Kernels in paper bag. Adjust as needed. 5) Add toppings as you like. There you go, much cheaper and probably a healthier alternative than prepackaged microwave popcorn! Previous post: Every Day is an Opportunity for Thoughtfulness, Even If You Have ADHD! Next post: Several Studies Say Drinking COFFEE May Be GOOD, even GREAT!